One pot. One pound of ground beef. One easy, cheesy 20-minute weeknight skillet your whole family will like. Add water, dressing and oregano. Bring to boil. 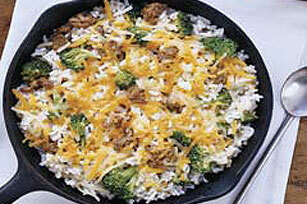 Stir in broccoli and rice; cover. Simmer on low heat 5 min. or until rice is tender. Top with cheese. For a different flavor base, substitute KRAFT Greek Vinaigrette Dressing for the Italian dressing and ATHENOS Traditional Crumbled Feta Cheese for the Cheddar cheese.